4 - 3,4................Bingo von Ellendonk. 5,5,5 - 4,5..........Jago von Beelen. 5 - 4,5................Blanka von der Au. Pacco von der Weyermühle passed the Finnish ZTP with 1A rating for character and SG for conformation in 1996 and tested clear for PHTVL / PHPV. His brother, Ningicosan von der Weyermühle, placed 30th at the IDC Weltmeisterschaft in 1999 and passed the Körung with Körklasse 2A rating. Their sire, Hertog Conan van Manensheide, was the winner of the D.V. Meisterschaft in 1993 plus winner of numerous show titles and passed the Körung 'for life' with highest rating for hardness and working drives. Pacco's sire lived to 7 years of age with the cause of death being Bloat and his dam, Gina von der Weyermühle, passed away at 8½ years of age from cancer. Milla: dam of Briska's “S” litter (Sumo, Senta). 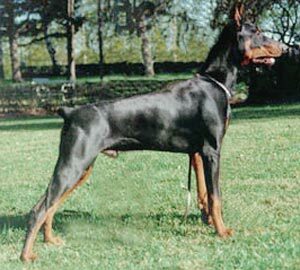 Queenie: IPO 3, winner of Swedish IPO Championship for Dobermanns and passed the Swedish Körung with KORAD+2 rating.